Shameem Ara Sheuli: Like many other sectors, role of women in fishing is also invisible in Bangladesh. Women in fishing community repair boats, knit nets, separate different species of fish after big catch, release fish-fries, dry fish for sale or household consumption, even go to fishing with their counterparts. But their contribution is never recognized. There is no official statistics about how many women give labour in this sector. Fishing community in our country has been fishing in the rivers, haors and beels (small waterbodies) and in the sea for centuries. For different reasons including encroachment of rivers and waterbodies, lack of proper management, water pollution or impact of climate changes, the sources of their livelihood is becoming narrow day by day. Many are leaving their profession and taking alternative jobs in different parts of the country. But fishermen of the haor regions like Sunamganj have a different reality. They have not much choice to change their occupation. They live in the small villages in the midst of the haor or beels. These villages remain surrounded by water most of the time of the year. During the dry season people can produce crops only. It’s a one crop land. No other business activities in haor areas, one of the remotest places in the country, except fishing. Now the survival of fishing community is challenged and situation of women of this community has become more vulnerable. Specially destitute women of this community has been suffering a lot to survive. They need to be addressed separately, in any intervention, sametime they will not stay behind of their counterpart if get opportunity, story of Kamala Rani Barman emphasised on that. Kamala, a widow, at her late fifties, never thought she would ever come to Dhaka to attend a workshop and shared her experience with government officials and foreigners or give an interview to journalists. “ I was poorer of the poor, I had to struggled a lot with three kids to manage meals for three times after my husband, who was a fisherman, died 20 years ago” she was memorising her difficult days with eyes full of tears. Kamala is a fisherwoman. 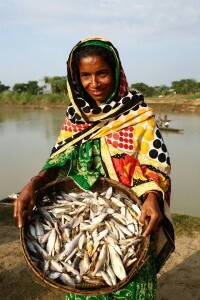 She is the elected treasurer of ‘Abuhoa Nainda Nodi Beel Baborharkari Smaity’, a community group formed by real fishermen and fisherwoman, known as Beel Users Group (BUG)). It has taken lease of a beel that surrounded the villege Kholachandpur. But it was not easy for her, not for her community either. Kholachandpur is one of the remotest village in Bishwambhar Pur upzila in Sunamganj. The tiny villege remains inundated by water almost nine months of the year. Around 120 households live there. Most of them are Hindu. They dont have farm land, live mainly on fishing or fishing business. During the dry season they work as farm labour or travel to other places seeking works. Like others, Kamala and his fisherman husband were living on fishing. Their community has been fishing in the ‘Abuhoa Nainda Nodi Beel’ adjcent to their village for generations. They believe they have a right to fishing there. But they were wrong. According to law of the land, these waterbodies belong to the Ministry of Land and they always lease those to businessmen, local political or influential people for certain period of times. Normally they always occupy more land than they are leased. They use armed guards to prevent poor fishermen from fishing. They never care about the bio-diversity of the beels or haors and take out of everything from it. Therefore, a number of species disappeared from these places forever. When her husband died, she fell into deep trouble. Her children were very young to earn, it was only her to run the family. She tried to take loan from NGO’s to do some income generating activity. But there was no NGO nearby her place. She went to Bishwambhar Pur, upzila headquarter and asked for loan to some NGO’s. She was denied. None was interested to work in a remote place like Kholachandpur. She had to work as domestic help to survive. ‘Kamala was very poor, one Kamala could never be abled to manage lease money but many could do’. This was the concept with which Sunamganj Community Based Resource Management Project (SCBRMP) intervened in the district in 2003. It implementted “Jal jar jalmahal tar (Real fishermen and fisherwomen own the waterbody)” first time in the country. It recognized fisherwomen formally in the documents of government and entitled them to take lease of a waterbody in groups. The project was implemented by Local Government Engineering Department (LGED), co-financed by International Fund for Agricultural Development (IFAD). The project ended in March this year but by this time it transferred 250 waterbodies from Ministry of Land and leased to community groups. Now more than 9,000 fishermen in 11 upzilas are enjoying their access to their surrouding waterbodies. Among them 2248 are fisherwoman and Kamala is one of them. She is one of the 80 members who took lease ‘Abuhoa Nainda Nodi Beel’ with a contribution of only TK 1000, six years ago. It has changed her whole life. Fishing community has indegeneous knowledge, they know the law of nature from their forefathers and always follow it. They know when brood fishes released eggs, when to fishing when not, how to maintain a sanctuary. A real fishermen or fisherwoman would never destroy their sources of livlihood. BUG thakes lease of a waterbody and manage it protecting bio-diversity. It excavates beels and connecting canals, releases fish-fries, plant trees and maintains a sanctuary. Afetr she joined a BUG and started earning profit as a fisherwoman, her confidence grew up. She started taking part in the meetings of the group regularly. She contested the BUG election and won twice the post of treasurer. She was illiterate. Never went to school. Never went to outside her village. She learnt to give signature, speaking to people. Now she goes to markets, banks and government offices and attend meetings. She has become the face of fisher community of Kholachanpur. Kamala is an idol among the women of her village. Including her 32 women are members of ‘Abuhoa Nainda Nodi Beel Baborharkari Smaity’. 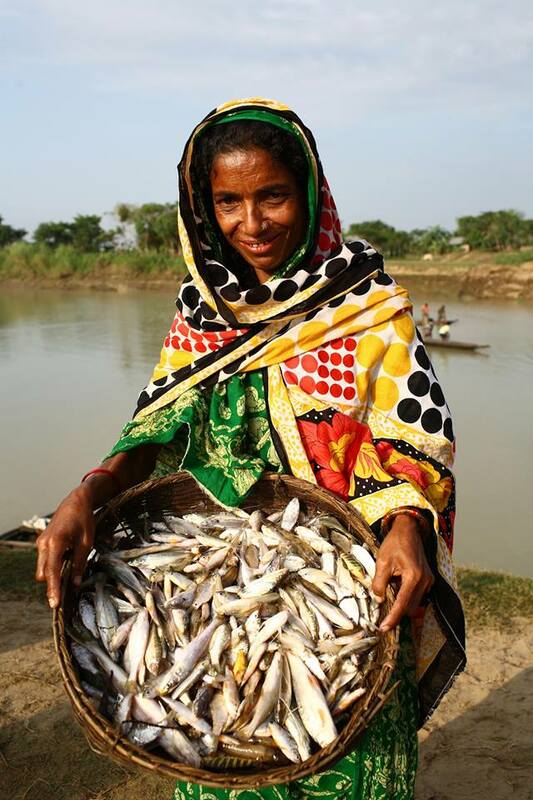 Parul Begum (38) is another fisherwoman who belongs to the ‘Dhala Pakna Beel Users Group’ under Jamalganj Upzila in Sunamganj. She lives with her five children and sick husband in Chandpur village. Parul is one of the member of ‘Dhala Pakna Beel Users Group’ who plants and takes care of Swamp forest in the beel which work as a sanctuary for the fish during the monsoon and a home of birds. A recent study of Worldfish supports the comment of Parul. It found that fish species increased from 73 t0 139 in project areas in Sunamganj. On the otherhand, Ministry of Land says, it is earning more money than before from leasing waterbodies to communitycommunity groups. It is getting lease money regularly from the poor fishing community than rich people who took it previously. After successful implementation of SCBRMP, the government has launched a new project ‘ Haor Infrastructure and Livelihood Improvement Project’ (HILIP) expanding its area of intervention from one district to five. Under HILIP, now 300 waterbodies will be handed over to fishermen groups in Sunamganj, Habiganj, Brahmanbaria, Kishorganj and Netrokona.